In a fast-moving series of events, President Richard Nixon ordered all federal installations to meet air and water pollution standards within three years, signed an executive order to fund clean-up of pollution on military bases, and more. 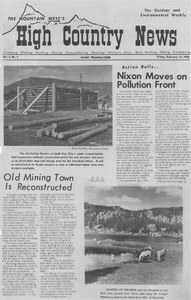 The gold mining town of South Pass City, Wyoming, until recently a ghost town, is slowly coming back to life, with plans underway for reconstruction of several history buildings. The land cries out -- Do we have a conscience? Photos of Green Mountain and Crooks Mountain in central Wyoming, which have been bulldozed in the search for jade and uranium.